“I stay in touch with her a little bit—just emails here and there,” Wentz told People, describing Kim as “the nicest person ever,” who just happens to be “like, a trillion times more famous” than she was when they worked together 10 years ago. What do you think they email about? Maybe Kim still keeps up with Fall Out Boy’s music. They have a new album out, today, called M A N I A; it is my duty to tell you that.) Maybe sometimes “Thks fr th Mmrs” comes on at the grocery store and Kim is like “lol thnx for the memories :-)”. I’m not even trying to be funny, I think that’d be really cute. Wentz also told People he sent Kim “some boots” with her son Saint West’s initials on them—Wentz also has a son named Saint—and she hit him back, sending his son a pair of Yeezys. Slightly cooler, but don’t worry about it Pete. That was still a nice gesture you did. Sorry, I feel like I really glossed over how both Kim and Wentz have sons named Saint, and in that, I have done a disservice to you. Celebs, amirite! What are the odds. 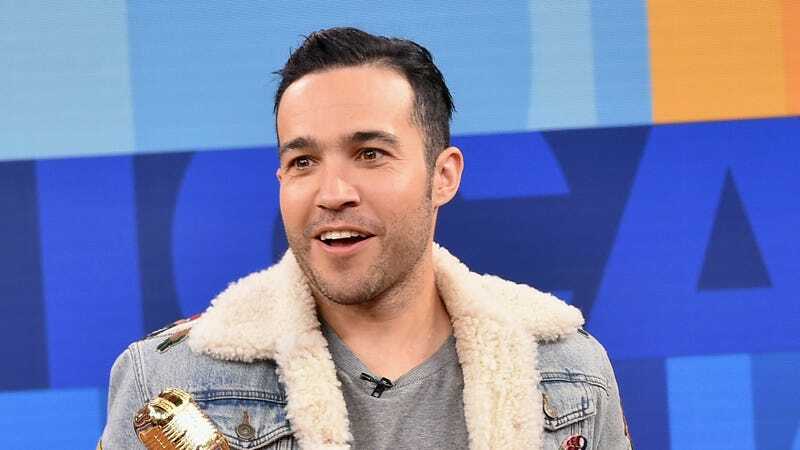 Saint Wentz is a year older than Saint West, though, so don’t get ahead of yourself—if anything, Kim stole Pete’s idea. I’m pretty sure that’s how that works.